Basic Life Support (BLS or BCLS) CPR class for healthcare providers to renew CPR Certification skills for the American Heart Association (AHA). BLS for Healthcare Providers certification class. Students and New Healthcare Providers who need Basic Life Support (BLS or BCLS) CPR for healthcare providers that is American Heart Association (AHA) certified. CPR Class for Medical and Healthcare School Programs. Need to renew your PALS skills? Register now for a stress-free Pediatric Advanced Life Support recertification class. Relaxed learning environment. American Heart Association (AHA) certified course. HeartSaver CPR is NOT for healthcare providers. This class is an American Heart Association CPR class for teachers, personal trainers, coaches, life guards and anyone else in the public who needs CPR for infants, children and adults. BLS, ACLS, and PALS Classes. Official American Heart Association Online Classes. 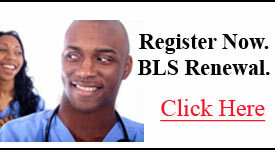 Take the online BLS, ACLS or PALS portion at your convenience on your own computer. WE COME TO YOU! The most convenient and cost effective way for medical, dental, surgery, etc offices to certify BLS, ACLS and PALS American Heart Association provider cards as a group. Stress-Free Megacodes in a relaxed learning environment. Advance Cardiac Life Support (ACLS) certification classes teach you the skills of ECG, pharmacology, and CPR in order to successfully run a code.We promise a Stress-Free Megacode and a friendly, relaxed class environment. Pediatric Advance Life Support (PALS) certification classes teach specialized healthcare providers how to recognize, prevent, and treat pediatric medical emergencies. PALS is taught in a Stress-Free Classroom. HeartSaver First Aid and CPR combo classes are for non-healthcare providers that need to satisfy basic First Aid and CPR training. American Heart Association classes that teach First Aid and CPR to the Public. 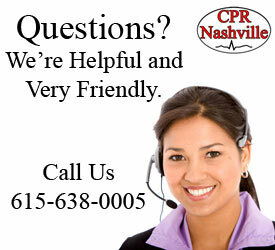 Schedule Your HeartSaver CPR, BLS for Healthcare Providers, ACLS, or PALS Skills Check in the Nashville, TN area. 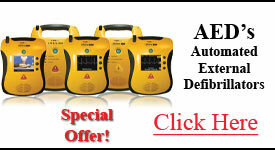 AED’s for Sale | How to Buy the Best AED for You! How to Buy the Best AED for You! Automated External Defibrillators come in many different types. It is essential for you to understand which type fits your needs best. 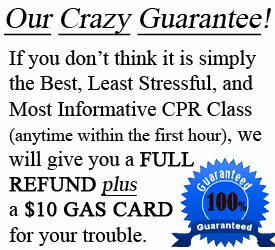 Question: What CPR classes do you offer? Answer: CPR Nashville offers Basic Life Support (BLS) CPR, as well as Advanced Cardiac Life Support (ACLS) classes, and Pediatric Advanced Life Support (PALS) courses. We offer both 1st time certifications and renewal classes for current healthcare providers, as well as students in medical related school programs. 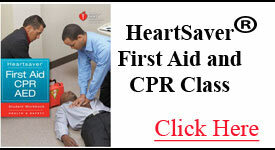 We also offer HeartSaver CPR and HeartSaver First Aid classes. 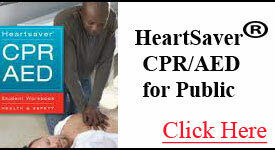 HeartSaver classes are American Heart Association CPR and First Aid for non-healthcare providers. These classes are for the public including teachers, coaches, personal trainers, babysitters/day care, life guards and everyone else in the community who needs CPR training for infants, adults, and children or a First Aid certification from the AHA. Question: If I’m a healthcare student in a healthcare field such as nursing, physical therapy, medical school, dental school, radiology, paramedic, etc, which class do I need? Answer: You need to take the First Time CPR Certification class. 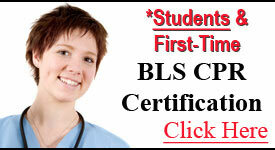 This class is also known as Basic Life Support or BLS class (also known as BCLS class) for healthcare providers. It satisfies all requirements for school programs. 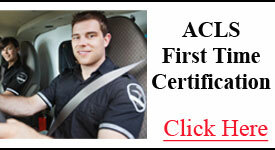 Question: Are all your CPR classes American Heart Association (AHA) accredited? Answer: Yes. 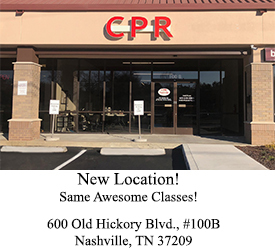 CPR Nashville is 100% AHA accredited, and you will receive an official AHA Provider Card that is good for 2 years after successful completion of your class. Question: Do you provide Basic Life Support (BLS), Advanced Cardiac Life Support (ACLS), Pediatric Advanced Life Support (PALS), and HeartSaver CPR and First Aid certifications to large groups and offices? Answer: Absolutely, and at a discounted price! We will send AHA instructors to your office anywhere in the Nashville area. This is a popular choice for Nashville surgery centers, dental groups, doctors offices, busy healthcare providers, as well as schools, daycare facilities, and corporations that want CPR training. For more information, please contact our office at 615.638.0005. We are always here to help. Question: What is the usual size of your classes? Answer: We keep small class sizes in order to provide the best, hands-on AHA Classes Nashville has to offer! *Our classes are organized, stress-free and fast. Question: Do I need to buy a student manual or study guide? Answer: The American Heart Association requires that all students have access to an AHA manual before, during and after class. For Advanced Cardiac Life Support (ACLS) and Pediatric Advanced Life Support (PALS) 1st time classes, an American Heart Association manual is included in the price of the class. The manual will be mailed to you immediately after registration. Question: What kind of payment do you take? Answer: We accept online payment through our secure website. You can pay with Paypal or any major credit card including Visa, Mastercard, Discover, and American Express. Question: Can I renew my Basic Life Support card the same time I renew my Advance Cardiac Life Support card? Answer: Yes. 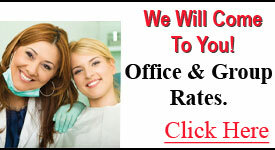 This is a popular choice for many of our Healthcare providers. 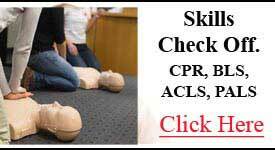 Much of what is taught in a BLS class is reviewed at the beginning of an ACLS class anyway, so this is a great option to renew both certifications in the same day without too much extra effort. 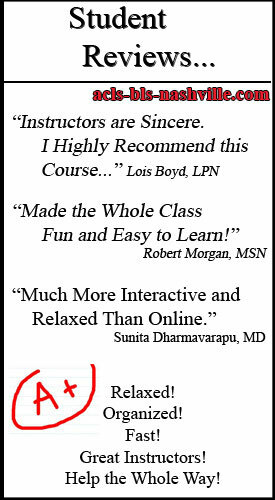 Our goal at CPR Nashville is to provide our students with the very best certification class experience possible. 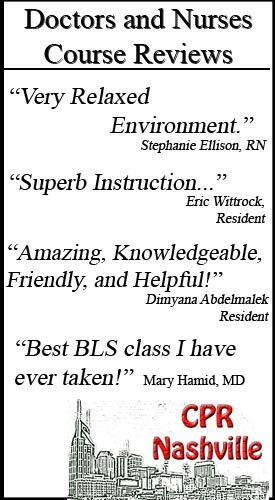 Whether you’re taking a non-healthcare for the public class or an advanced class for healthcare providers, you can rest assured that you will be in a stress-free, relaxed and fun classroom environment. All of our instructors are American Heart Association certified to teach each class. Our instructors then go through further training with us to insure that our students get the best quality classes Nashville has to offer. Question: What areas do you serve? Answer: We serve all surrounding Nashville TN areas including Franklin, Smyrna, Spring Hill, Williamson, Murfreesboro, Hendersonville, Lebanon, Gallatin, Mt. Juliet, and Forest Hills. 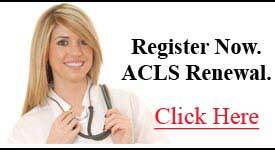 For any other questions please email us at info@acls-bls-nashville.com or call our office at 615.638.0005. Question: Where are the classes located? © 2014 BLS-ACLS-PALS Classes, Nashville | AHA CPR Classes All rights reserved.